Level This is a long walk with a substantial climb to start off with. The terrain is not particularly difficult as it is mostly on dirt roads and good footpaths. The route is mostly signposted, but there are a few places where you could go wrong, so download the pdf walk description to refer to if in doubt. When to go The route takes you into the high Sierra Nevada, so it is not normally accessible during the winter as it is likely to be covered in snow. It is worth checking at the information kiosk in Capileira for advice on the latest snow and weather conditions. We would recommend setting out early in summer – although some parts of the climb are shaded, you will also be walking through open areas with little or no protection from the sun. Water There is a spring where you can refill water at the highest point of the walk, but make sure you take enough for the long climb to get there. Location: Alpujarras, Capileira, Trevélez The hike links the villages of Capileira and Trevélez in the Alpujarras. 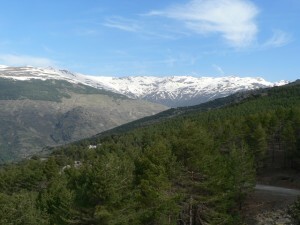 By Bus: Capileira and Trevélez are served by Alsa services from Granada bus station (3 per day), which also stop at other towns in the Alpujarras, including Órgiva, Lanjarón, and Busquístar. You can use the same buses to return to your starting point at the end of the walk. Click here for more details. 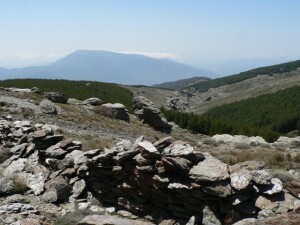 This hike forms one stage of the long-distance Sulayr hiking route (GR-240) which encircles the Sierra Nevada. It is possible to combine it with more stages to make a multi-day hike, but in practice this requires a lot of planning because the Sulayr route takes you into pretty inaccessible territory. 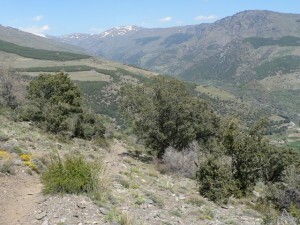 A more manageable option for a 2 or 3 day trek is to combine this walk with a section of the GR-7, another long-distance walking route that goes from village to village through the Alpujarras. See our descriptions of the GR-7 sections from Trevélez to Busquístar and Busquístar to Capileira. There are plenty of options for overnight accommodation in Capileira, Trevélez and Busquístar. 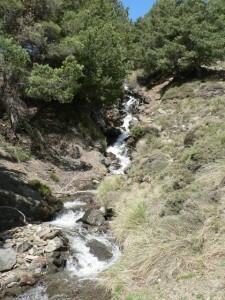 This entry was posted in Accessible by Public Transport, All Hikes, Alpujarras, Autumn, Capileira, Hikes, More than 5 hours, Spring, Summer, Trevélez and tagged Sulayr. Bookmark the permalink.